Bill Little writes an article in 2013 that deals with the repercussions of OU hiring Coach Jim Helms away from Texas. Following is part of the article. The worst, however, was yet to come. Just before the season had started, archrival Oklahoma had raided Royal's coaching staff with the hiring of Jim Helms, a former Longhorn running back who had just spent the last several years as a coach at Texas. The last minute hiring fueled the resentment at UT toward Sooner coach Barry Switzer, since Helms had been a part of all of the spring and fall preparations for the season. Whether or not Helms' knowledge of Texas' plans made a difference quickly became a point of contention, particularly after Oklahoma hammered the Longhorns, 52-13, and Helms was presented the game ball in the Sooner dressing room after the contest. What followed, however, is one of the untold stories of a remarkable turnaround -- and a lesson that would play itself out years later in another place and time. Texas was 2-2 as an angry Royal came into a team meeting the following Sunday. Royal began by questioning the team's desire and commitment, but before he had gone far into the speech, Arnold, who would become an all-SWC defensive back that year, interrupted him. "That's not right, coach," Arnold said from the back of the room. "They changed everything we had prepared for -- stuff they had done last year and this year. We played as hard as we could. We were going full-speed to the wrong places." The uneasy silence in the room was broken when defensive guru Mike Campbell spoke up. The 52 points OU had scored were by far the most ever against a Campbell-coached Texas defense. "He's right, Darrell," he said. "They seemed to know everything we were doing before we did it." Royal knew that this loss belonged to him and not changing the game plan to compensate for OU hiring Coach Helms was a mistake. The 1973 OU game also changed weight lifting forever at Texas. Jay Arnold says "We were part of the 'old school' when it came to physical and strength training." "We would lift and condition in the spring and off-season, but put the weights away during the season. Oklahoma did it differently. They were working on weights all year long. We changed after that game, and never looked back. We were in an era of enlightened transition as far as that was concerned." When it came to describing Bill Wyman, Darrell Royal would call him the best center he ever coached. The part of Bill Little’s article concerning Bill Wyman is quoted below. The pictures were added by Billy Dale to add depth to Bill’s article. They say a picture is worth a thousand words, and there is one photo of former Longhorn Bill Wyman that shows just that. Shot in the bench area of a Texas football game in the season of 1973, the picture by the acclaimed sports photographer, the late Linda Kaye, shows the rugged face of an embattled center, his long hair dripping in sweat plastered across his forehead. That will always be the lasting image of the man who was the lynchpin of the offensive line during part of one of the greatest eras of Texas Longhorns football. 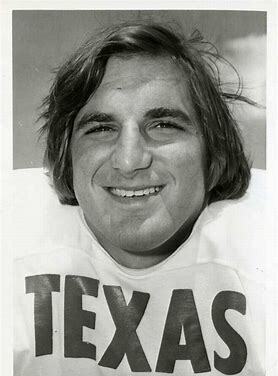 Wyman, who died at 61 early this week due to complications of Parkinson's disease, was a three-year letterman who earned all-Southwest Conference honors in 1972 and 1973 and was a consensus all-American in 1973. A freshman in 1970, Wyman was part of the last group of NCAA Division I players who were eligible to play only three seasons with the varsity, and he made the most of it. By the middle of his junior season, he had become one of the best centers in Texas Longhorn football history. But while Wyman's presence was felt throughout his career, it was his tough, rugged leadership as a captain during his tumultuous senior season of 1973. "He never said a lot," recalls teammate Jay Arnold. "He led by example. Coaches and players alike remember [him] as the best there was." As the center in an offense which helped fullback Roosevelt Leaks earn all-American honors and a place in College Football's National Hall of Fame, Wyman was a part of an offensive line which carried the Wishbone offense into the middle years of its success. From the season of 1968 through Wyman's senior year of 1973, Texas won six Southwest Conference championships and went to a record six straight Cotton Bowl games. The 1972 team beat Alabama in the New Year's Day game of 1973, finishing the season with a 10-1 record and a No. 3 national ranking. When it came to describing Bill Wyman, Royal would call him the best center he ever coached, and he forever linked Wyman and his running buddy Leaks after Roosevelt's record-setting day against SMU. "Wyman was more consistent out there Saturday than any player we had. Over a career, I don't think we've had any player who has been more consistent that Wyman. He and Leaks go together like ham and eggs," Royal said. Following his playing career, the 6-2, 238-pound Wyman was chosen to play in both the Coaches' All-America game and the Senior Bowl. He was picked in the sixth round of the NFL draft by the New York Jets, but chose instead to return to his native Houston area roots and entered the construction business. He battled cancer and won during the 1990s, but he couldn't defeat the ravages of Parkinson's. Centers and other offensive linemen are hard to quantify when it comes to excellence. Running backs, receivers, quarterbacks -- and all kickers and defensive players -- have some statistics that can be pointed to. Bill Wyman's legacy will be left as that of John Wayne in the movie "The Quiet Man." Folks never fooled with him. He was a tough, tough football player, but most of all he was a good man and a good friend. And if that is how you're remembered, that's a pretty good deal. 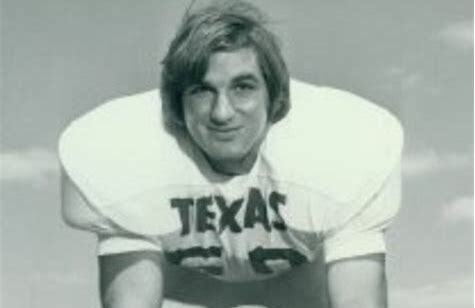 Alan Weddell was an offensive lineman for the Texas Longhorns under Darrell Royal from 1970-1972. He was part of the 1970 national championship team. Weddell graduated in 1973 from Texas-Austin with a bachelor's degree in production engineering. He later earned a master's degree in education and administration from the University of Houston–Victoria. Weddell began his coaching career as junior varsity and varsity assistant at Angleton High School from 1973 to 1977. He then went on to coach at Victoria High School in Victoria, Texas for twelve years, first as an assistant, since 1982 as head coach. Weddell guided the Stingarees to a 47-32-1 record, winning district championships in 1986 and in 1989. He was twice named 26-5A Coach of the Year and won 35 of his last 40 regular season games. In 1990, he started coaching at La Marque High School, where he turned the Cougar program into one of the perennial powerhouses in Texas high school football. From 1990 until 1997, Weddell coached the Cougars to three straight state championships (1995–97) and five consecutive appearances in the state title game. La Marque lost both the 1993 and the '94 title game against Stephenville High School, which was then coached by Art Briles. Weddell was a six-time District Coach of the Year and a Galveston County Coach of the Year on three different occasions. Weddell compiled a 103-13 record at La Marque. Eleven coaches who worked with Weddell during his time at La Marque moved on to acquire head coaching jobs of their own and seven of them are still high school head coaches. Entering the collegiate ranks in 1998, Weddell was hired by Texas A&M head coach R. C. Slocum to assist defensive coordinator Mike Hankwitz as middle linebackers coach. Staying in College Station until Slocum's retirement in 2002, Weddell was a part of four bowl teams (1998 Sugar Bowl, 1999 Alamo Bowl, 2000 Independence Bowl and 2001 Galleryfurniture.com Bowl) and the 1998 Big 12 championship team. After a short stint as defensive coordinator at Brazoswood High School in Clute, Texas, Weddell joined Art Briles' staff at the University of Houston in 2005. Originally hired as linebackers coach, Weddell was promoted to defensive coordinator in April 2006, after Ron Harris stepped down. With Weddell at the helm, the Cougar defense allowed just 21.9 points and 339.1 yards per game during the 2006 season. After coaching staff changes when Kevin Sumlin replaced Art Briles as head coach, Weddell left Houston. It was the early ’70s and he was a seventh grader living in Euless, a small town situated between Dallas and Fort Worth. There were tests performed on each budding athlete. There were the typical throwing, running and tackling drills and the more intricate sessions of tire pulls and navigating through several series of ropes. Baab, who will be inducted into the Texas High School Football Hall of Fame May 7, remembers that day like it was yesterday. But a phone call to his house soon after he turned in his uniform changed Baab’s life forever. The series of unfortunate events that led Baab to be the anchor of the offensive line proved to be that of fate. Baab racked up the awards as the center for Euless Trinity High School as a teenager, grabbing All-America and first-team all-state honors as a senior in 1977 despite playing for 4-5-1 Trinity squad. Even as a junior the year before, the Trojans enjoyed an undefeated regular season before losing to Midland Lee in the first round of the playoffs. There was a college just over 200 miles south of Euless that had rarely crossed Baab’s mind. The University of Texas had a new coach in Fred Akers, a former assistant of recently retired Darrell Royal who previously served as the head coach of Wyoming. “I will tell you the truth,” Baab said. “It was just as much Earl Campbell as it was Fred Akers that got me interested in Texas. The year before I went to Texas, Fred Akers did the smartest thing and handed the ball to Earl Campbell as much as he possibly could. Though a center by trade, Baab played guard for the Longhorns for two years before moving back to snapper. He had his best season as a senior, as Baab was voted first-team all-SWC, second-team all-American and guided his team to an upset of No. 3 Alabama in the Cotton Bowl, leading Texas to a No. 2 final ranking. The Longhorns posted a 35-12-1 mark in his four seasons in Austin. Baab left the state after being drafted by the Cleveland Browns in 1982. He played 11 successful seasons in the NFL that included two trips to the AFC Championship Game in 1986 and 1987. After retiring in 1993, Baab served as a motivational speaker, a successful car dealership manager and is currently a personal trainer. But the native Texan looks back on his days in the Lone Star State with a sense of endearment.